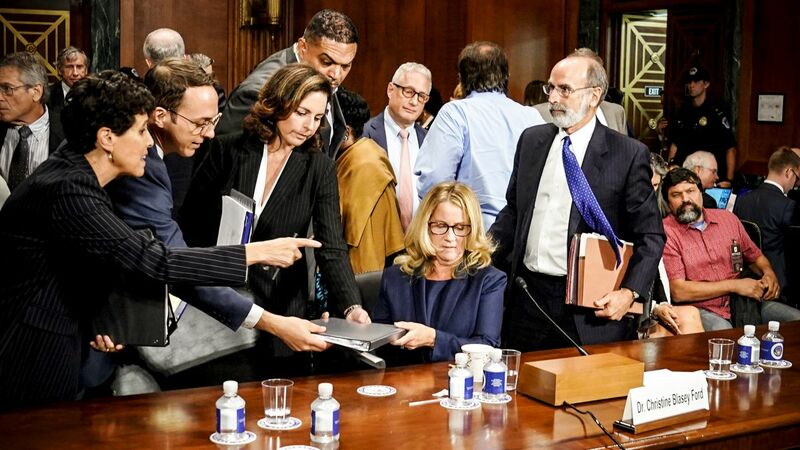 Not many knew or have heard the name Christine Blasey Ford until she made headlines after she came forward to accuse Federal Appeal Court Judge Brett Kavanaugh of sexually assaulting her back in 1982; her accusation came after the jurist was shortlisted by President Trump to become an Associate Justice of the Supreme Court of the U.S.
After The Washington Post published her account, she was invited by the Senate Judiciary Committee to testify her allegations during the hearing of Kavanaugh’s Supreme Court nomination. Following her allegations and testimony, there have been many questions about who she is, what she does and all and here is all there is to know about. The widely read American professor of Psychology was born in Potomac, Maryland in November 1966 as Christine Margaret Blasey. She is not the only child of her parents as she has two brothers (Tom and Ralph III). While in high school, she was into diving and was on her regional sports’ diving team. She was part of the diving team that accompanied Olympic diver, Greg Louganis to the White House in 1980 to discuss the Summer Olympics boycott. Christine attended Holton-Arms School; a private University preparatory school for girls located in Bethesda, Maryland from 1978 to 1984. From 1984 to 1988, she was at the University of North Carolina at Chapel Hill, where she bagged her first degree in experimental psychology. She has a masters in clinical psychology from Pepperdine University and a PhD in educational psychology from the University of Southern California in 1996. In 2009, Christine Blasey Ford bagged another masters’ degree epidemiology with emphasis on biostatistics from Stanford University School of Medicine. Ford is widely read and published in her field. She started her career in 1988 at Standford as a teacher and would later work at the Stanford University School of Medicine as a research psychologist, specializing in designing statistical models for research projects. Ford also worked as a professor at the Stanford University School of Medicine Collaborative Clinical Psychology Program. She currently teaches at Palo Alto University. As a member of a consortium group at Palo Alto University, Christine is also actively involved in educational programs at Stanford University School of Medicine. Through the consortium group (Pacific Graduate School of Psychology), she teaches subjects like statistics, study methodologies and psychometrics. Asides teaching, Ford has also served as a consultant for several pharmaceutical companies. She has also worked at Corcept Therapeutics as the director of biostatistics and collaborated with FDA statisticians. She has written and co-written several books which cover several subjects and topics like depression, 9/11 attack, child abuse among others. Christine Blasey Ford made headlines after she came forward to accuse Court of Appeals Judge, Brett Kavanaugh of sexually assaulting her. Once it was confirmed that President Donald Trump had picked Brett to succeed retired Justice Anthony Kennedy in the Supreme Court, Ford headed to The Washington Post to accuse the judge of sexually assaulting her back in 1982. She also met her congresswoman, Anna Eshoo, who she also told her story; Anna was convinced of her credibility and together they went to Senator Dianne Feinstein. The Senate Judiciary Committee would later delay their vote on the nominee so as to give the accuser the opportunity to testify before them. According to Ford, the incident happened back in 1982 at a house in Montgomery County, near a country club and her parents were not home at the time of the incidence. Kavanaugh and a friend had walked into the house drunk and laughing maniacally, he (Kavanaugh) pinned her down to a bed and tried to take off her clothes and had his hand over her mouth to muffle her screams. She said she eventually was able to escape by running into the bathroom and then found her way outside of the house. Kavanaugh, of course, denied all of Christine’s allegations calling them “totally false and outrageous”. Christine Blasey Ford is the daughter of Paula K. and Ralph G. Blasey Jr. Her parents are currently in their eighties and are registered Republicans. The academia has been married to Russell Ford since 2002. Ford is an engineer and an alumnus of the University of Rochester and Stanford University School of Engineering. They are proud parents to two teenage boys. Also Read About: Who is Justin Ryan Simpson, O.J. Simpson’s Son, Where is He Now? Russell has backed up his wife’s allegations of sexual assault. He said Christine had detailed the assault during a couple therapy session, recalling how she was trapped in a room with two drunk teenage boys years back and how one of them had pinned her down on a bed, prevented her from screaming.